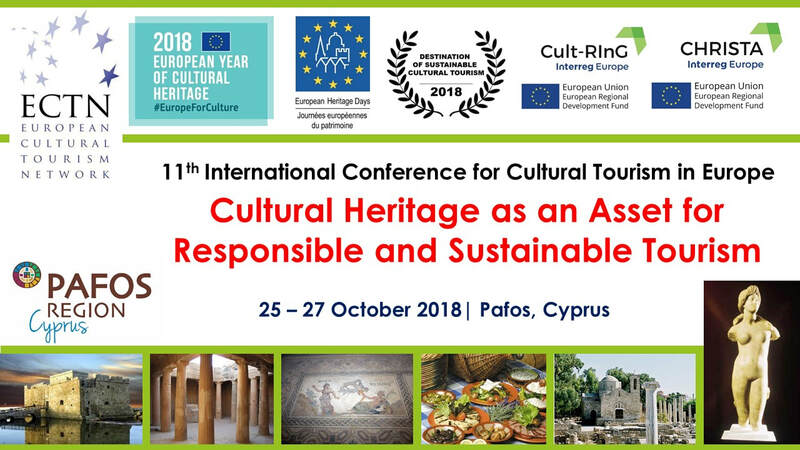 ​​The 11th international conference ‘ Cultural Heritage as an Asset for Responsible and Sustainable Tourism will discuss the latest trends in the field of cultural heritage and responsible and sustainable tourism, including innovation, creativity, design, r&d and cultural tourism product development. The conference is organised in close cooperation with Pafos Regional Board of Tourism, lead partner of the Interreg Europe project CHRISTA – Culture and Heritage for Responsible, Innovative and Sustainable Tourism Actions (2016 – 2020) and partner in the Interreg Europe projects Cult-RInG (Cultural Routes as Investment for Growth and Jobs) and DESTI-SMART (Delivering Efficient Sustainable Tourism - Sustainable Mobility, Accessibility and Responsible Travel). 7. Contributions by Cultural and Creative Industries (CCIs) to Cultural and Creative Tourism. Participants, including selected presenters will have to make their own arrangements for travel and accommodation. ECTN cannot cover travel costs. A post-conference study tour in Pafos Region is being planned. The Awards ceremony of the ECTN prize for ‘Destination of Sustainable Cultural Tourism 2018’ will take place during the Conference. The 2018 ECTN Awards are in partnership with Europa Nostra and European Travel Commission, supported by NECSTouR, as a contribution to the European Year of Cultural Heritage 2018. ECTN as a member of the Stakeholders Committee of European Year of Cultural Heritage has included this Conference in the official programme of events. ECTN as a signatory of the ‘European Tourism Manifesto for Growth & Jobs' has included this Conference in the Manifesto Programme 2018. ECTN cannot cover travel expenses for selected presenters, but there will not be any delegate fees.